The Rechabite Friendly Society was active in Cromer from the 1880s with the last members joining in the 1940s. The records of the Society are extant and we've included a selection of the earlier membership of the Society in the list below, where it may be of interest to family historians. Some friendly societies subscribed to local hospitals, which enabled them to recommend their members for treatment. The IOR Cromer Tent paid an annual subscription of one guinea to Cromer Cottage Hospital, entitling them to recommend two people for admission in the year, �one for each half guinea�. Women had their own societies, particularly in industrial areas where there were large numbers of female workers. In Norfolk female societies were uncommon but many of the early female Tents of the Rechabites had been amalgamated with the male groups, making them the first order to allow mixed membership. 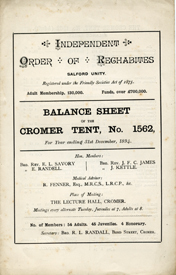 The first two members of the Cromer Tent were husband and wife Alfred and Sarah Ann Salter, The growth of the temperance movement in the late nineteenth century had a strong appeal to women and in the years 1884-1908 women made up a high proportion of the membership of the Cromer Tent. Although her husband was one of the first members of the IOR in Norwich, when Catherine Scarlett wished to join the Rechabites the "Self-Help" Tent in Norwich did not accept women, so she was initiated into the "Cromer" Tent in January 1886. She took an active role in the movement and in 1888 she became one of the first members of the "Onward" (Female) Tent in Norwich. This was the first female branch of any of the affiliated orders in the city. 1900 address Colne Lodge, 1903 Prince of Wales Rd, 1907 West St.